While thousands of lucky fans will brave the crowds at the Lucas Oil Stadium in Indianapolis, Ind. to fill the coveted seats at this Sunday’s Super Bowl, many more in the U.S. will enjoy the game from home—in front of the TV, with mobile phones and tablets at the ready. As the New York Giants and New England Patriots prepare for kickoff, here are several ways to make the most of the big game with Google—wherever you’re watching. You can explore the full list in our Game Day with Google playbook, a new page on Inside Search that we’ve filled with tips on how to use Google to enjoy the game. 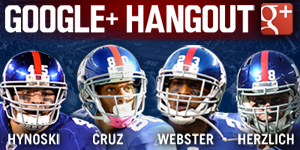 Visit the Giants and Patriots Google+ pages for behind-the-scenes coverage and details on a chance for you to join the Giants pre-game hangout on Thursday for a face-to-face chat with the players. Be sure to leave a comment on their post for a chance to participate. On Monday, Feb 6 at noon ET, stop by the NBC Sports Google+ page for a Hangout On Air with CNBC sports business reporter Darren Rovell. He’ll chat about the previous day’s game and review the best commercials with fans that drop in. Leave a comment on this NBC Sports post to throw your name in the hat to be one of the lucky participants who will chat with Rovell On Air. Super Bowl party rivalry is already in full swing with Indiana leading the pack in Google searches for [super bowl party], ahead of both New York and Massachusetts. Despite New York being the home state of the buffalo wing, searches for [chicken wings] are nearly 50 percent higher in Massachusetts. If you’re looking for a dip recipes, [hummus] reigns supreme, followed by guacamole, queso and bean dip. Use Google Recipe search to find a recipe with the ingredients to make everyone happy. Or, swing by ChefHangout on Google+ to join a cooking class on favorite Super Bowl party foods. Talking babies or barking dogs? You decide. It wouldn’t be the Super Bowl without the commercials. We’ve already seen a flurry of pre-game teasers pop up on YouTube and Google+, but which commercial will reign supreme? Our fifth annual YouTube Ad Blitz in partnership with NBC Sports enables you to replay and vote on your favorite commercials online from a laptop, mobile phone or tablet. 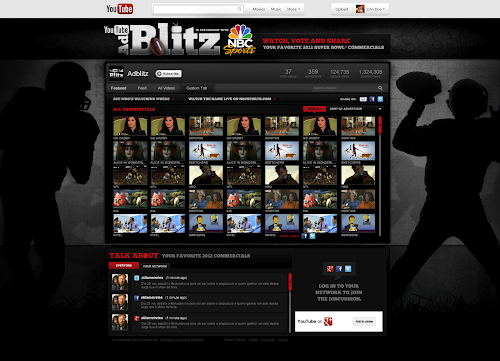 Tune in to theYouTube Ad Blitz channel or NBCSports.com to watch and rate the commercials. If the halftime show interests you more than counting yards gained and lost, get an early taste of the show with Madonna’s music video premiere for “Give Me All Your Luvin” featuring Nicki Minaj and M.I.A on her official youtube.com/Madonna channel this Friday and on the YouTube Ad Blitz channel pre-game on Sunday. You can pre-order her deluxe album right there in the video description. And make sure to tune in to Madonna’s Google+ profile all week long for her latest news.